Advil, the trade name for the compound ibuprofen, is one of many popular over-the-counter medications in the class of non-steroidal anti-inflammatory drugs, or NSAIDs. Runners make ample use of NSAIDs because of the high incidence of injuries and pain of an inflammatory nature that they experience. While Advil is extremely effective for treating a range of running injuries, like all medications it carries the risk of serious side effects, and prophylactic supplementation appears to exaggerate these. Advil, like other NSAIDs, exerts anti-inflammatory effects by reducing the production of pro-inflammatory substances called prostaglandins. It does this by inhibiting cyclooxygenase, a key enzyme in the prostaglandin synthetic pathway. In addition to reducing inflammation, ibuprofen reduces pain and fever. It is a mainstay in the treatment of rheumatoid arthritis. At typical doses, it is less toxic to the liver than other over-the-counter painkillers, such as Tylenol and aspirin. People who take Advil for chronic conditions often notice a decrease in effectiveness after six or more months of drug therapy. Inflammation in runners is usually localized to muscles, especially those in the calves, hamstrings, quadriceps, shins and hips. The severity of inflammation may be proportional to the distances run. Therefore, runners who participate in 26.2-mile marathon races and ultramarathons, such as the Western States 100-Miler in California, are notorious for pre-event Advil supplementation. The repetitive impact stress of running, especially over hilly terrain, is responsible for most muscle damage and subsequent inflammation. Over sufficiently long distances and on particularly grueling courses, tendons and ligaments may become inflamed as well. Despite the popularity of pre-race Advil use, evidence from various research studies suggests that there is little to no benefit to this practice. 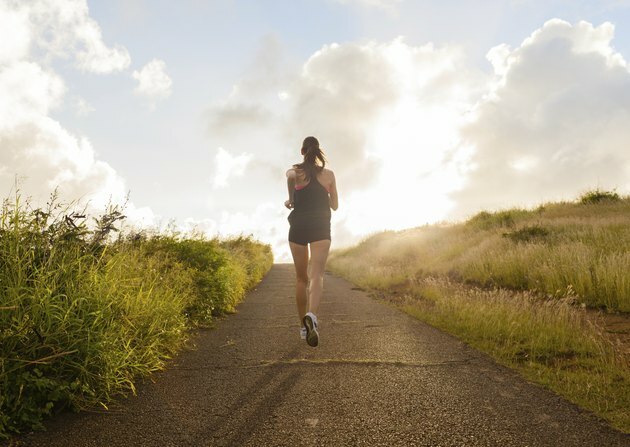 A study published in the November 2006 issue of "Brain, Behavior, and Immunity" examined participants in a 100-mile race, and the researchers found that there was no difference in the levels of soreness and inflammation between those who took Advil before the event and those who did not. In addition, there was no difference in the perceived levels of pain and exertion during the run between the two groups. Research strongly points to the conclusion that pre-run Advil use is not only ineffective, but dangerous. Prostaglandins increase blood flow to the kidneys, so the inhibition of their production can predispose runners to renal failure, especially in longer events where dehydration is at issue. All NSAIDs can damage the stomach mucosa and result in ulceration and bleeding in the gastrointestinal tract. Advil use before running can also lead to endotoxemia, the leakage of bacteria from the colon into the bloodstream. On the whole, health professionals strongly discourage Advil use before running.